You are probably wondering why there are M42 cameras featured on a website dedicated to the Mamiya NC series cameras. Well, after I bought my first Mamiya P-mount adapter for the NC series, I got more interested in M42 screw mount lenses. The more I checked into these I realized that there are very interesting lenses available with this specifc mount and they are usually also very affordable. A few months later I already had accumulated several “new” lenses. Since it is very hard to find additional P-mount adapters, I started looking for a suitable M42 screw mount camera body. 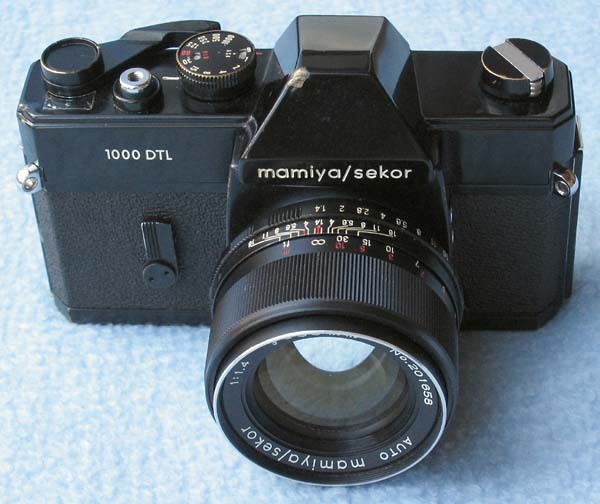 Of course, it had to be a “Mamiya”, and this mamiya/sekor 1000 DTL was a nice sample I found on eBay. The main difference that is instantly noticeable compared to the Mamiya NC series is the size and weight. The TL/DTL series is just so much bigger and heavier, and I think “NC” stands for New Compact (this assumption is based on a German advertising). Except for the very hard to find 2000 DTL this model is the “top of the line” version of the TL/DTL series offering spot as well as average metering, fastest shutter speed of 1/1000 sec and also a self-timer. mamiya/sekor 1000 DTL camera body with AUTO mamiya/sekor 55 mm 1:1.8 standard lens. With the winding lever being pulled away from the camera by approx. 15° (meter turned on), push in the lever without pressing the off-button all the way towards the camera. This will stop down any automatic aperture M42 screw mount lens. I really like this design and I find it much more convenient than the separate depth-of-field preview button of the Mamyia NC series cameras. Joerg Krueger informed me about an incompatibilty issue of the Mamiya TL/DTL series with Pentax SMC (Super Multi-Coated) Takumar lenses for M42. Mike Butkus has an excellent online manual for the mamiya/sekor 1000 DTL available on his website. In the meantime, I also found a 500 DTL in nice condition which I added to my collection. mamiya/sekor 500 DTL with 50 mm 1:2.8 standard lens (left) and 1000 DTL with 55 mm 1:1.8 standard lens. Pictured on the right is the quite rare black version of the 1000 DTL which I recently found on eBay for a fair price. Cosmetically, it is not in perfect condition but seems to work fine functionally. There is also a black 2000 DTL which is extremely rare and very hard to find. An almost mint one was sold on eBay in 2004 for over US$ 500 (!). A black mamiya/sekor1000 DTL with 50 mm 1:1.4 standard lens. After I got my first Mamiya 1000 DTL, I also became interested in the Mamiya MSX/DSX series cameras. Especially the open aperture metering got my attention. In the meantime, I added a view Mamiya MSX/DSX cameras to my collection. You can still use any regular M42 lens on these cameras since stop-down metering is still possible and works the same way as with the TL/DTL series. You can also use Pentax SMC M42 lenses on these cameras. MSX/DSX cameras clockwise starting at front: DSX 1000B, DSX 500, MSX 500 (w/o hot-shoe), MSX 500 (with hot-shoe), and 1000 DSX. This camera offers a unique feature among the many M42 cameras - it has a true mirror lock-up function (there is a little lever on the left side of the mount, similar to the original Contax RTS). The shutter speeds are electronically controlled and you can set the shutter speed dial at intermediate values. the fastest shutter speed is 1/1000 sec., and the flash sync speed is ofiicially 1/90 sec. but it also works fine at 1/125 sec. The camera also features a metal shutter instead of the usual cloth shutter of cameras from the same time period. The metering works similar to the Pentax Spotmatic, there is a lever on the right side of the lens mount which you have to press down. If the exposure is not set correctly, there are little red arrows in the viewfinder which will indicate in which direction the aperture value or shutter speed has to be changed. Yashica made many other M42 cameras, and there is an excellent overview by Alan Corey of Older Yashica M42 Cameras available online. Mike Butkus als has an excellent online manual for the Yashica TL Electro X available on his website. 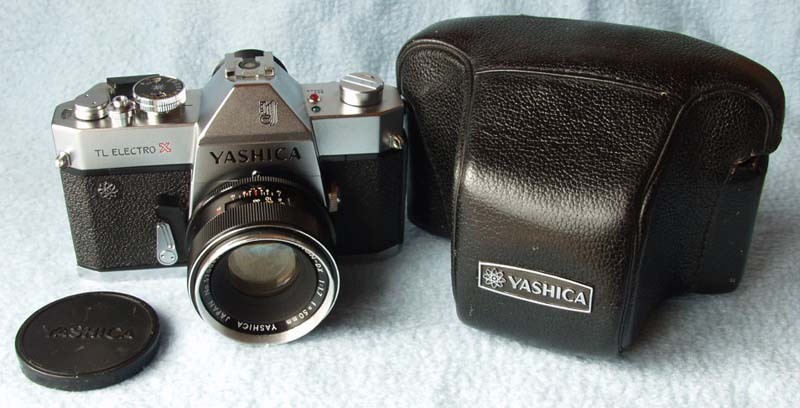 Yashica TL Electro X camera with Yashinon-DX 50 mm 1:1.7 standard lens. This is a Praktica MTL 5 camera rebadged under the Revue label (brand name of a German mail order company). The lens looks almost exactly like a Carl Zeiss Jena lens and it appears to be almost identical to the Pancolar 1.8/50 lens (except for the smallest aperture being f/16 instead of f/22). I found the camera and lens in mint condition on eBay for a reasonable price. The camera features the Praktica film loading system which I find a little cumbersome but works fine once you get used to it. This camera was built approx. in 1984 and features a metal blade shutter with speeds from 1 sec. to 1/1000 sec. (fastest flash sync speed is 1/125 sec.). The camera also features a mechanical self timer and a hot-shoe. It is a pretty basic camera but seems to work just fine. 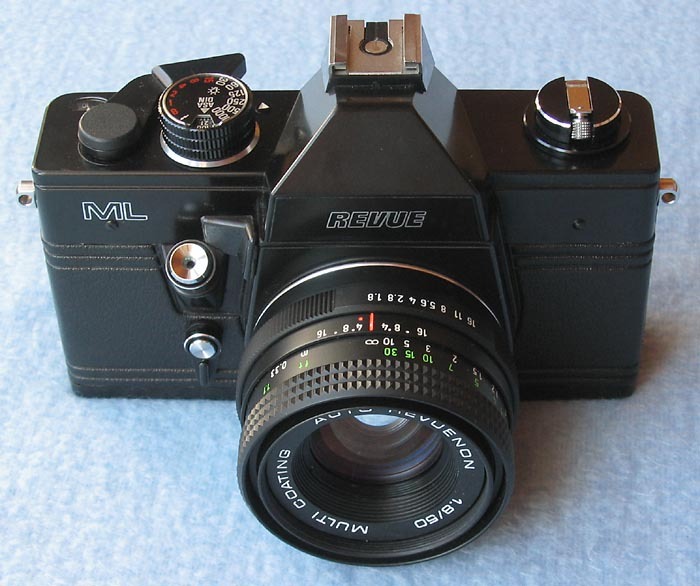 Revue ML camera with Auto Revuenon 1.8/50 multi-coated lens.